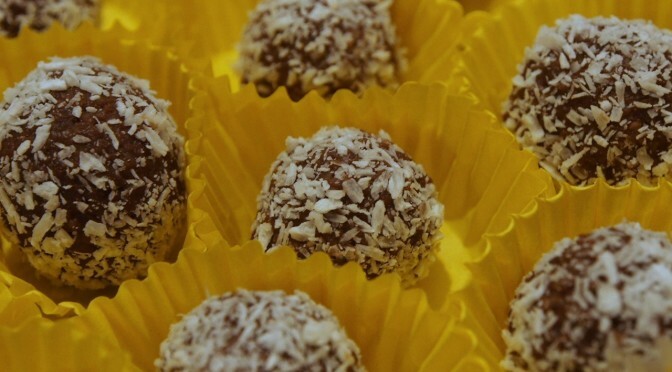 For those of you who still need a very-last-minute present for that colleague at work or special auntie of theirs – here is one of my go-to recipes: rum balls that look like fancy chocolates. It’s fuss-free, relatively quick and you will likely have all ingredients at home already. Believe me when I say that you will have a hard time messing it up. My Mum has been making them for Christmas ever since I can remember and us kids used to be restricted to a certain number of them per day. Especially the year she ran out of normal (38% proof) rum and used 80% proof. Good times. Melt the chocolate and mix with the other ingredients. Take little amounts and roll them into little balls. Roll balls in shredded coconut or whatever else you chose as coating. Put into Christmassy paper moulds (or your mouth). 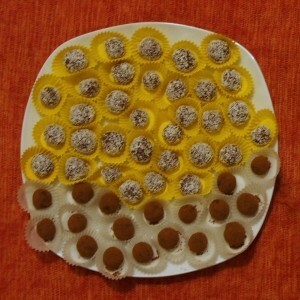 Didn’t I say those rum balls were easy to make? If you now wrap them up nicely or even have a little box you can put them in you’ll be the star at the next Christmas party you’re invited to. What is your emergency Christmas present? Previous PostAliciouslife: Pangs of guiltNext PostMerry Christmas and happy holidays!